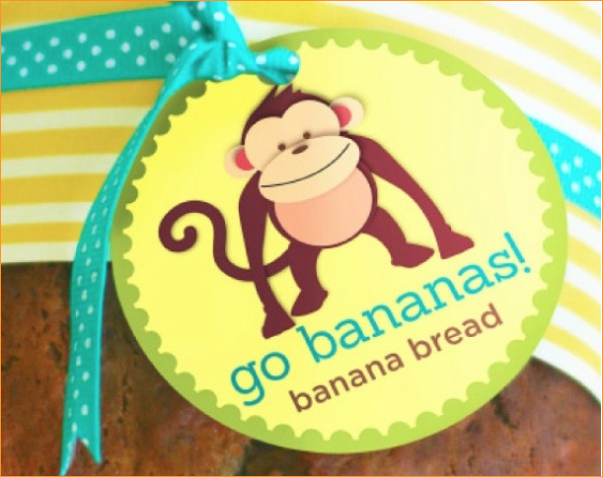 Turn your Go Bananas Bread from the Kidstir Bakery kit into a kitchen gift or bake sale item with this fun cut-out. Print out the tag and the yellow patterned wrapper. Cover your banana bread in plastic wrap, then tape on the patterned wrapper. Punch a hole in the top of the gift tag. String a ribbon through the center. Tie it around the bread loaf. Now give it to a special teacher or friend. Or sell it at a bake sale! How about putting your baking efforts for a bake sale? Here’s a bake sale sign to bring in the banana bread buyers. Did you ever wonder where those bananas grow that you put in these sweet tasty bakery treats? If you can’t get enough bananas – here’s a healthy banana treat for kids.